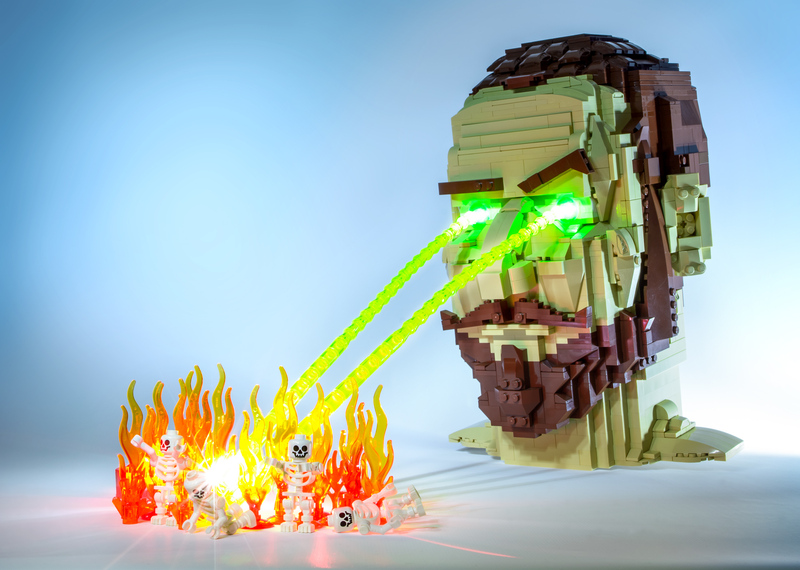 This image is a composite of multiple shots of my LEGO head sculpture with its LED eyes illuminated, shot in near pitch black with a super slow exposure. After I set up the display — with the head’s eyes glowing, the skeletons surrounded by flames, and the columns of green lasers balanced — I would snap several long exposure shots in the dark, while waving around a small flashlight towards the subjects. In some of the later shots towards the end of the shoot, I placed miniature cheap LED finger lights behind the flames to make them glow and create small lens flares. Later in Photoshop I merged different photos from the whole shoot to create this final image.